BUYSSCHEURE, France (AP) — It is early afternoon on a spring day in 1944. On a French farm 20 miles from the English Channel, two young brothers tend the cows — perhaps they goof off a bit — as their father brews beer. Then a plane falls from the sky. A P-47 Thunderbolt, an American fighter plane, has been hit by German fire. On the ground, the boys watch as the last moments of a desperate American pilot unfold. “When the plane fell, there were still bullets exploding” from the plane’s .50-caliber machines guns, recalls Marc Cooche. He was 12 then; at 86, he’s still haunted by memories of that afternoon. In Cooche’s recollection, the plane veered to avoid some electric cables, maneuvering in the air for two or three minutes before plummeting nose first. The crash left a deep crater in a field of beets. Flames fed by the plane’s fuel licked the sky, and the hole burned for days. In a world war, the loss of a single plane and its 22-year-old pilot, Lt. Frank Fazekas, in rural France drew scant attention. A little more than a week later, just a few miles away, the Allies would launch the largest seaborne invasion in history. Less than a year later, the Nazis surrendered. Over time, the pit in the field was filled with brick, dead livestock, aluminum and ceramic roofing tiles. Dirt blanketed the makeshift grave, so the farmers could plant again. A couple years later, a British team looking for their missing found aircraft parts and alerted American authorities. Americans visited the site and deemed the plane and remains “non-recoverable.” The wreckage was mangled and burned, leaving little to compare to dental records or fingerprints. Crops grew. Train tracks were laid, 100 yards away. A road moved. Mayors changed. Some of the land, including the crash site, eventually ended up in the hands of a neighbor. Cooche stayed on the land, started a construction business and had children. But he never forgot about the pilot and his plane. He’s not the only one. Frank Fazekas Jr. never knew his father. He was just 6 months old at the time of his crash, living with his mother in a tight-knit Hungarian community in Trenton, New Jersey. His mother was the recipient of the telegram from the adjutant general: “The secretary of war desires me to express his deep regret that your husband Second Lieutenant Frank Fazekas has been reported missing in action,” it began. It was she who received his personal effects, including $17.93, the money he left behind when he departed for his final mission, according to his Individual Deceased Personnel File. The son would focus on his father’s signature. “I would practice signing my name like he did,” he says. In school, a teacher told him that he pledged allegiance to the flag differently — with more intent — than other kids did. Because his dad flew, he loved airplanes. He got a degree in aeronautical engineering and became an Air Force pilot in the Vietnam War. He later worked with Department of Defense contractors and now, at 74, he’s in his third career as a tour business owner in New Hartford, New York. 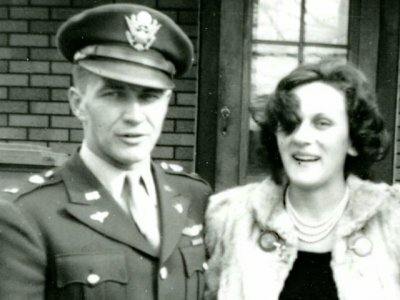 The family knew little about Fazekas Sr.’s death, other than sparse account of his the wingman, Lt. Charles H. Nott, which differs in some aspects than Cooche’s recollection: Nott reported the plane spun out of control, with no radio call for help. For years they thought he was buried at the Ardennes American Cemetery in Belgium. So in 1983, when Fazekas, Jr. was on active duty, he went to visit the Belgian cemetery. He found his father’s name on a wall. A cemetery worker mistakenly told him that he was buried there. His mother, Theresa, never got over the death of her husband. She was his “darling,” ″sweetheart” and “dearest wife” in his letters home. “He was the love of my mother’s life. She talked about him constantly, even after she remarried,” Fazekas says. They knew where his father’s plane had crashed. And they knew that his remains were still there. The effort to find Fazekas Sr. began in 2014, when University of Wisconsin-Madison researchers succeeded in returning the remains of another soldier to his family. That inspired them to reach out to Department of Defense officials the next year to propose a partnership to find the missing. It would become the university’s Missing in Action Recovery and Identification Project. It was good timing. After being criticized for years for failing to recover and identify more remains of U.S. service members, the Defense Department unveiled a revamped agency called Defense POW/MIA Accounting Agency. More than 82,000 Americans remain missing from conflicts since World War II — nearly 73,000 of them from that war. Military officials combed through hundreds of cases. They settled on looking for Fazekas, because the statements of Cooche and the wingman pointed to a specific location. Scouts were deployed to France to inspect the crash site and talk with Cooche. But the next spring, just a few months before excavation was to start, ground penetrating radar found no sign of the crash. “We were frantic, we were very frantic because we put a lot of time into this case,” says Charles Konsitzke, facilitator of the project. A few days later Department of Defense officials searching the archives found aerial images of the area taken two days after the crash. Konsitzke took the image and overlaid it with a current aerial photo — and they found the exact location. “It really was dumb luck,” says Leslie Eisenberg, a Wisconsin Historical Society archaeologist who also worked on the project. Cooche’s memory had been tricked because the road moved years ago to make way for the train, which was only 100 yards from the crash site. The searchers included volunteers from the University of Wisconsin-Madison, burning up their personal vacation time, along with students from the University of Wisconsin and University of Hawaii and Defense Department personnel. They ended up going twice to the site, in 2016 and 2017, digging a 10- to 15-foot deep hole in the hard clay. They found six machine guns. They found the plane’s engine. And they found some bones of Frank Fazekas Sr., and his dog tags. They gave him a pair of gloves to help out. As the hours passed, he found a piece of the dash board, part of a starter switch, a green plastic cover for the landing gear indicators. He used a wire brush to clean off the mud from the starter motor. He kept some items, including a black rubber piece that may have come off the control stick. “I thought that might be something my father actually held on to,” he says. He also met the man who was present for his father’s last moments: Marc Cooche, who still lived 300 yards from the crash site. Through an interpreter, they discussed what happened the day of the crash. Until then, Fazekas only knew the wingman’s account. But Cooche told Fazekas what he saw, that his father may have tried to maintain control until the end, that he may still have been alive when he crashed. There were many hugs. Fazekas gave the witness a small model of his father’s plane. “It was like family, almost,” Fazekas says. On May 8 — the 73rd anniversary of the end of the war in Europe — Buysscheure will pay tribute to an airman whose remains had rested within its boundaries, unheralded, for almost three quarters of a century. The building that houses a library, performance room and school will be renamed the Frank Fazekas Cultural Center, and a plaque with his name will be added to the monument to local war dead. Fazekas, his wife and some university officials plan to return for the festivities. Cooche also will be there. He remains grateful to the Americans for liberating his country. He chokes up at the prospect of seeing Fazekas again, and standing next to him as his father is honored. Frank Fazekas Sr., though, will be an ocean away. His remains have finally been returned to his homeland. He will be buried Wednesday at Arlington National Cemetery. Carrie Antlfinger reported from Wisconsin. Jeffrey Schaeffer and Alexander Turnbull reported from France. Michael Hill and investigative researcher Randy Herschaft contributed to this report from New York.